"Nothing real can be threatened. Nothing unreal exists. ﻿Herein Lies the peace of God." 44 Anything in this world that you believe is good and valuable and worth striving for can hurt you and will do so. Not because it has the power to hurt, but just because you have denied it is but an illusion and made it real. And it is real to you. It is not nothing and through its perceived reality has entered all the world of sick illusions. All belief in sin, in power of attack, in hurt and harm, in sacrifice and death has come to you. For no one can make one illusion real and still escape the rest. For who can choose to keep the ones which he prefers and find the safety that the truth alone can give? Who can believe illusions are the same and still maintain that even one is best? 45 Lead not your little lives in solitude with one illusion as your only friend. This is no friendship worthy of God's Son, nor one with which he could remain content. Yet God has given him a better Friend in Whom all power in earth and Heaven rests. The one illusion that you think is friend obscures His grace and majesty from you and keeps His friendship and forgiveness from your welcoming embrace. Without Him you are friendless. Seek not another friend to take His place. There is no other friend. What God appointed has no substitute, for what illusion can replace the truth? 46 Who dwells with shadows is alone indeed, and loneliness is not the Will of God. Would you allow one shadow to usurp the throne that God appointed for your Friend if you but realized its emptiness has left yours empty and unoccupied? Make no illusion friend, for if you do, it can but take the place of Him whom God has called your Friend. And it is He who is your only Friend in truth. He brings you gifts that are not of this world, and only He to whom they have been given can make sure that you receive them. He will place them on your throne when you make room for Him on His. ﻿ 47 This is a course in miracles. And as such, the laws of healing must be understood before the purpose of the course can be accomplished. Let us review the principles that we have covered and arrange them in a way that summarizes all that must occur for healing to be possible. For when it once is possible, it must occur. All sickness comes from separation. When the separation is denied, it goes. For it is gone as soon as the idea which brought it has been healed and been replaced by sanity. Sickness and sin are seen as consequence and cause in a relationship kept hidden from awareness that it may be carefully preserved from reason's light. 48 Guilt asks for punishment, and its request is granted—not in truth but in the world of shadows and illusions built on sin. The Son of God perceives what he would see, because perception is a wish fulfilled. Perception changes, made to take the place of changeless knowledge. Yet is truth unchanged. It cannot be perceived, but only known. What is perceived takes many forms, but none has meaning. Brought to truth, its senselessness is quite apparent. Kept apart from truth, it seems to have a meaning and be real. 49 Perception's laws are opposite to truth, and what is true of knowledge is not true of anything that is apart from it. Yet has God given answer to the world of sickness which applies to all its forms. God's answer is eternal, though it operates in time where it is needed. Yet because it is of God, the laws of time do not affect its workings. It is in this world, but not a part of it. For it is real and dwells where all reality must be. Ideas leave not their source, and their effects but seem to be apart from them. Ideas are of the mind. What is projected out and seems to be external to the mind is not outside at all but an effect of what is in and has not left its source. 50 God's answer lies where the belief in sin must be, for only there can its effects be utterly undone and without cause. Perception's laws must be reversed, because they are reversals of the laws of truth. The laws of truth forever will be true and cannot be reversed, yet can be seen as upside-down. And this must be corrected where the illusion of reversal lies. 51 It is impossible that one illusion be less amenable to truth than are the rest. But it is possible that some are given greater value and less willingly offered to truth for healing and for help. No illusion has any truth in it. Yet it appears some are more true than others, although this clearly makes no sense at all. All that a hierarchy of illusions can show is preference, not reality. What relevance has preference to the truth? Illusions are illusions and are false. Your preference gives them no reality. Not one is true in any way, and all must yield with equal ease to what God gave as answer to them all. God's Will is One. And any wish that seems to go against His Will has no foundation in the truth. 52 Sin is not error, for it goes beyond correction to impossibility. Yet the belief that it is real has made some errors seem forever past the hope of healing and the lasting grounds for hell. If this were so, would Heaven be opposed by its own opposite, as real as it. Then would God's Will be split in two and all creation be subjected to the laws of two opposing powers until God becomes impatient, splits the world apart, and relegates attack unto Himself. Thus has He lost His Mind, proclaiming sin has taken His reality from Him, and brought His love at last to vengeance's heels. For such an insane picture, an insane defense can be expected but cannot establish that the picture must be true. 53 Nothing gives meaning where no meaning is. And truth needs no defense to make it true. Illusions have no witnesses and no effects. Who looks on them is but deceived. Forgiveness is the only function here and serves to bring the joy this world denies to every aspect of God's Son where sin was thought to rule. Perhaps you do not see the role forgiveness plays in ending death and all beliefs that rise from mists of guilt. 54 Sins are beliefs which you impose between your brother and yourself. They limit you to time and place and give a little space to you, another little space to him. This separating off is symbolized in your perception by a body which is clearly separate and a thing apart. Yet what this symbol represents is but your wish to be apart and separate. Forgiveness takes away what stands between your brother and yourself. It is the wish that you be joined with him and not apart. We call it "wish" because it still conceives of other choices and has not yet reached beyond the world of choice entirely. 55 Yet is this wish in line with Heaven's state and not in opposition to God's Will. Although it falls far short of giving you your full inheritance, it does remove the obstacles which you have placed between the Heaven where you are and recognition of where and what you are. Facts are unchanged. Yet facts can be denied and thus unknown, though they were known before they were denied. 56 Salvation, perfect and complete, asks but a little wish that what is true be true; a little willingness to overlook what is not there; a little sigh that speaks for Heaven as a preference to this world which death and desolation seem to rule. In joyous answer will creation rise within you to replace the world you see with Heaven, wholly perfect and complete. What is forgiveness but a willingness that truth be true? What can remain unhealed and broken from a Unity Which holds all things within Itself? There is no sin. And every miracle is possible the instant that the Son of God perceives his wishes and the Will of God are one. 57 What is the Will of God? He wills His Son have everything. And this He guaranteed when He created him as everything. It is impossible that anything be lost if what you have is what you are . This is the miracle by which creation became your function, sharing it with God. It is not understood apart from Him and therefore has no meaning in this world. 58 Here does the Son of God ask not too much but far too little. He would sacrifice his own identity with everything to find a little treasure of his own. And this he cannot do without a sense of isolation, loss, and loneliness. This is the treasure he has sought to find. And he could only be afraid of it. Is fear a treasure? Can uncertainty be what you want ? Or is it a mistake about your will and what you really are? Let us consider what the error is, so it can be corrected, not protected. 1 The Holy Spirit mediates between illusions and the truth. As He must bridge the gap between reality and dreams, perception leads to knowledge through the grace that God has given Him, to be His gift to everyone who turns to Him for truth. Across the bridge that He provides are dreams all carried to the truth, to be dispelled before the light of knowledge. There are sights and sounds forever laid aside. And where they were perceived before, forgiveness has made possible perception's tranquil end. 2 The goal the Holy Spirit's teaching sets is just this end of dreams. For sights and sounds must be translated from the witnesses of fear to those of love. And when this is entirely accomplished, learning has achieved the only goal it has in truth. For learning, as the Holy Spirit guides it to the outcome He perceives for it, becomes the means to go beyond itself, to be replaced by the Eternal Truth. 3 If you but knew how much your Father yearns to have you recognize your sinlessness, you would not let His Voice appeal in vain nor turn away from His replacement for the fearful images and dreams you made. The Holy Spirit understands the means you made, by which you would attain what is forever unattainable. And if you offer them to Him, He will employ the means you made for exile to restore your mind to where it truly is at home. 4 From knowledge, where He has been placed by God, the Holy Spirit calls to you to let forgiveness rest upon your dreams and be restored to sanity and peace of mind. Without forgiveness will your dreams remain to terrify you. And the memory of all your Father's Love will not return to signify the end of dreams has come. 5 Accept your Father's gift. It is a call from Love to Love that it be but itself. The Holy Spirit is His gift by Which the quietness of Heaven is restored to God's beloved Son. Would you refuse to take the function of completing God when all He wills is that you be complete? 1 Father, Your Son is perfect. When he thinks that he is hurt in any way, it is because he has forgotten who he is. And that he is as You created him. Your Thoughts can only bring me happiness. If ever I am sad or hurt or ill, I have forgotten what You think and put my little, meaningless ideas in place of where Your Thoughts belong and where They are. I can be hurt by nothing but my thoughts. The Thoughts I think with You can only bless. The Thoughts I think with You alone are true. 2 I will not hurt myself today. For I am far beyond all pain. My Father placed me safe in Heaven, watching over me. And I would not attack the Son He loves, for what He loves is mine to love as well. 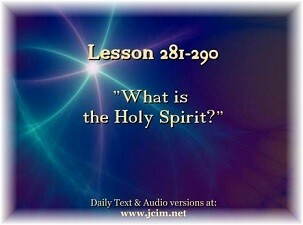 We are now reading and reflecting on the question, "What is the Holy Spirit?" (W.PII.Q7) The Holy Spirit is the aspect of God's Love taken into the dream. He is in our right minds where sanity and truth prevail. He is the Correction for the separation, so when we make the choice to forgive, we call on this part of the mind. Each time we bring our misperceptions to the truth, we experience more peace and joy until this becomes our only reality. The Holy Spirit is the mediator between illusions and the truth. Our part is to bring our illusions to Him so they can be replaced by the truth and truth can then shine through us. But how do we do that? We do it by looking at what is coming up in our minds that is blocking the love we are. We do it by looking without judging whatever comes up in our awareness. We look with honesty, courage, and simple acceptance that there is nothing wrong. We have come to identify with the ego thought system, but it is not what we are. When we are sad, angry, feel betrayed, feel frustrated, worried, depressed, anxious, needy, wanting to get something, wanting to control or manipulate, or experience anything not peaceful, it is important to recognize that there is the feeling or the thought (it doesn't matter which because they are the same) and take responsibility for it. While it seems to us that others are the cause of our upsets by what they do or say, nothing comes from anything outside of our own minds. It is the mind that is the source of our upsets. It is the wrong-minded choice for the ego and with it comes guilt and fear as a result of our belief that we have separated from God. Now the ego tells us that we had better hide from God's retribution, and so we live in a state of fear. We distract ourselves from the fear with various activities, but we must come to see that fear is not real, does not protect us, and has no power. What the Holy Spirit does is it bridges the gap between illusions and reality. What He needs from us is simple willingness to allow Him to translate sights and sounds from witnesses of guilt and fear to those of love. (W.PII.Q7.2.2). Basically, this means that everything we have made to hurt ourselves He can use for healing. In this world, our bodies were made for separation, differences, and attack; but, when we give them over to the Holy Spirit, they become a vehicle of communication for the purpose of forgiveness, healing, and extension of His love. The same can be said about our special relationships, which can be given over to the Holy Spirit so He can translate what we made to serve our specialness and bring it all up for healing and wholeness. Without the Holy Spirit in our right minds, we would be forever lost in the dream. Now, "Across the bridge that He provides are dreams all carried to the truth, to be dispelled before the light of knowledge." (W.PII.Q7.1.3) The ultimate goal is the attainment of the real world, which is the end of dreams. Learning is the means by which illusions are replaced by eternal truth. This learning requires that we recognize that we have been wrong about everything we think we know because we have been listening to the voice of the ego that has misled us. Now we can learn that there is another Voice that can bring us home. When Jesus speaks of God's yearning or God's incompletion, it is a symbol to communicate how deep, unchanging, and eternal is God's Love for us. This kind of symbolic language reflects our own yearning for God. In this world of dreams, we live with fearful images that reflect guilt and attack, which we see all around us in the world. They are not real, but in our current state, they appear very real, dark, and very frightening. What they are is a projection of the unhealed mind. The answer can only be experienced in the mind. When we bring our fear-based thoughts to the Holy Spirit, He shows us what we see as real and frightening are our own misperceptions. We are misguided in who we think we are and what the world is. He translates the sights and sounds that frighten us "from the witnesses of fear to those of love." (W.PII.Q7.2.2) This requires overlooking the error and seeing beyond it to the truth. The ego uses the sights and sounds of this world to keep us invested in the illusion. To us, the events of our lives all seem very real and solid. We agonize over issues in relationships, money, worthiness, career, future plans, health, and well-being, among other things. To us, they define the content of our lives, and their achievement seems to bring the fulfillment we seek through them. Yet it is always temporary and, ultimately, ends in pain. It is so very challenging to take what we experience and put it all to question, especially those things we define as pleasure. Jesus calls all of our experiences in the world, "children's toys" that we have given power to. They are our own idols that we substitute in our minds for God’s gifts. "All idols of this world were made to keep the truth within from being known to you, and to maintain allegiance to the dream that you must find what is outside yourself to be complete and happy. It is vain to worship idols in the hope of peace. God dwells within, and your completion lies in Him." (T.29.VII.6.1-3) (ACIM OE T.29.VIII.48) Jesus reminds us again that our happiness will never come from these idols, nor from seeking outside of ourselves. We can only know our happiness as we look at all of our misperceptions and bring them to the truth within. To seek outside of ourselves is what we came here to do, and we will only surrender to the truth when we recognize that we are seeking nothing of value. Jesus teaches that what we've made as substitutes and are attached to can never bring us happiness. Happiness can only be found in what we have been given by God in our creation. Yet we are not entirely convinced this is true. We continue to look for happiness in idols, but happiness is forever unattainable when we seek for it where it does not exist. Pleasure soon turns to pain. When we put all of our energy into serving our specialness and meeting our needs it is always at the expense of others. When we use others for our own purposes, we will hate what we think we have become because it is all based on our belief in sin and guilt. It is all about trying to get from others what we think is lacking in us. In our special relationships, we try to extract love from our brothers to meet our needs. Thus, we try to win at their expense. It is a relationship of bargaining and reciprocity. These relationships are used to try to fill our perceived lacks. We call the relationship one of special love when our needs are met, but how quickly these relationships become defined by special hate when part of the bargain is not perfectly delivered according to our expectations. It is not actually our brother’s bargain, but it is the one we have put on him with our expectations of what special love must look like for us to be happy. When we recognize the pain brought about through these special relationships, we turn to the Holy Spirit and call on Him for help. His function is to translate everything we have made to harm into His purpose of healing. Through forgiveness, all of our relationships are translated by Him to healing and holiness. In this Lesson, Jesus says, "I can be hurt by nothing but my thoughts." (W.281) This is truly a powerful idea---that only I have the power to hurt me. The responsibility is mine. If we are thinking with the Holy Spirit, we can only know peace. Whenever we are in pain, sad, hurt, or ill, we are actually manifesting these reactions and emotions with our own thoughts. Thus, the power is available to us to change our minds. We don't always welcome this power because with it comes the responsibility for everything that seems to be happening to us. It means we have called it all into our experience and are not the victims of the world we see. The stories we tell ourselves of how we have been victimized are simply not the truth. They justify our situation, where we prefer to blame others rather than see that we are responsible. Now we have an opportunity to choose again. The cause of everything we experience is in our own minds. All our pain in this world is caused by the guilt in our minds as a result of our belief that we have separated from Love. We project that guilt onto others and see it in them instead of in ourselves. Clearly, they give us lots of evidence that it is there. However, what we see in others originates in our own minds. They become a mirror, reflecting the sin and guilt we are holding onto. Attacking them for their misbehavior only brings more guilt into our own minds. If we are willing to take responsibility for our own self-hatred, without succumbing to the temptation to blame our brothers, we can know our brothers' innocence, as well as our own. This comes through a willingness to see that we have been wrong in our perceptions and to ask for help from the Holy Spirit to see our brothers differently. To forgive one brother completely is enough because Jesus will generalize this experience for us. The teaching Jesus is offering us through this Course is our way out of the pain of our lives. Today, we can be thankful for each brother who contributes so perfectly to this journey home, as well as to each situation we encounter in our lives. I am thankful for each one on my path who encourages me, challenges me, triggers me, attacks me, betrays me, supports me, comforts me, blesses me, and loves me. Through each one of my brothers, I am learning to open up to more and more healing and thus more and more love. As per the Lesson we will read tomorrow, to open up to love is to decide not to be insane any longer and to accept ourselves as we were created. We are not just beings who love, but we are Love itself! Together, we can affirm this in gratitude. As we reflect on Canadian Thanksgiving, we open our hearts to the blessings and miracles that surround us at every moment. In any relationship, recognize the perfection of being together because what your partner brings up in you is exactly that which you need to heal within yourself. What one brings to a relationship to be healed, the other has within himself as well. It may be in another form, but it will not be seen in the brother if it does not already exist in our own minds. One may show up as the critic and the other as unworthy, but beneath the critic is the fear of unworthiness and beneath unworthiness is self-judgment. What does self-judgment do? It invites judgment (criticism) from others. Both have the same dynamic going on. The relationship becomes powerful when there is a willingness to really look at our feelings and to look beneath them at the dynamic there. This kind of relationship does not always look lovely, but it is very powerful when used by the Holy Spirit for the healing of our minds. It requires a strong measure of honesty and self-responsibility. We do not like going into these dark places, yet Jesus says that he will go there with us. He asks only that we don't judge our experience, but simply accept it. Now more and more I am willing to invite the darkness to show up in any form that is helpful because I want to heal it. The darkness we discover within is not a bad thing. It is only difficult if there is no way out of it or if I believe it defines me. If there is judgment instead of acceptance and willingness, we will not want to look at our murderous, hateful, and painful thoughts. When we realize the miracle is right behind these dark thoughts, we are more willing to lift the veil of denial. The miracle is always waiting to shine forth. It is only obscured by darkness. There is no order of difficulty in the illusion. Every problem is the same. None of it is true or real. Every problem brought to the miracle is healed. Next time you feel anger coming up, recognize that it is just part of the flow of your life and your only choice is to stay in the experience of pain and suffering or bring it to a higher vibration by accepting the truth behind it. If you want to know the truth, be grateful for the darkness because it gives you an opportunity to know the light. When there is a willingness and readiness to look at all of the dark thoughts with acceptance, we are no longer in denial. The ego seems complex and complicated, yet we can be very grateful for how simple the truth is. I find that if I just take a moment to stop in the midst of conflict and ask for another way to see my brother, I can transmute what seems dark and difficult into a recognition that it is just a movie. If I think that what I am seeing and experiencing is the truth, I suffer. Nothing is ever wrong. Each instant that comes up is absolutely perfect. Our choice is only in how we see it. Why not accept everything that shows up? There really is no other option unless we want to suffer. The reason every moment is perfect is that it shows us exactly what we are thinking and feeling in that moment. Any difficulty is helpful because it shows us what is currently in the mind and offers us another way of seeing. Accept each moment as it is and accept responsibility for everything you see or judge. What happens if I am sad and choose to get upset with my sadness? It simply brings on the next moment. Yet if instead, I accept the sadness instead of judge it, then the next moment is one of a higher vibration. The energy of acceptance is very powerful because it brings us back into our essence. Movies can be very helpful in this regard. Last night I watched the movie Impossible , which was based on a true story of what a family experienced during the 2004 tsunami in Thailand. It was a very difficult movie for me to watch and there is a lot I could say about all of the emotions that came up in me, but, in the interests of brevity, I will only comment on what impacted me the most. We all have been taken in on an intellectual level about how painful the separation from God is, but the movie brought up an experience of the depth of that pain in me. It brought up such deep angst that I cried and cried. Yes, the separation as a human condition is painful as we have experienced in situations of divorce and death of loved ones. But for me, this experience through the movie took me deeper yet. I was able to get in touch with how deeply painful is the separation from God. Today, be willing to bring all your pain, anger, and suffering of any kind to the light without defending any of it. Accept your feelings without judging them. Follow us on TWITTER and join the ACIM community. Just use the hashtag #ACIM when you post! Students share Inspirational Quotes, Events, Personal Insights, ACIM News, and more. Presently all CIMS projects are supported by free will gifts of time, talent, and money. If you would like to support any of the activities of the Society in any way, please do not hesitate to get in touch. Because of the international character of CIMS, the internet is our primary means of communicating and collaborating. To make a Tax-Deductible Donation in support of the Daily Lessons just click Here or the "DONATION" Lily. ALSO, by means of your will or other estate plan, you can name "Course in Miracles Society" as the beneficiary of a portion of your estate, or of particular assets in your estate. In this way, you are honoring your loved ones while also providing critical support to the extension of LOVE.